George W. Bush: "America Reshaped Our Approach to the Middle East"
On December 5, 2008, President George W. Bush delivered his valedictory Middle East policy speech (excerpted below) before the Brookings Institution's Saban Forum in Washington, D.C., a tour d'horizon of developments in the region, ranging from the fight against terrorism in the aftermath of 9/11 and the decision both to invade and democratize Iraq, to rapprochement with Libya, the withdrawal of Syrian forces from Lebanon and, finally, the Annapolis peace process. Bush's omissions, however, are also illustrative. He speaks of extremism but, more than seven years after the 9/11 attacks, fails to mention Islamist ideology as a motivating factor. And while he had declared a global war on terrorism, he draws equivalence between Palestinians and Israelis killed during the Palestinian terrorist campaign of 2001 and appears also to draw equivalence between the refusal of late Palestinian Authority chairman Yasser Arafat to make peace and the reluctance by Israeli prime minister Ariel Sharon to offer territorial concessions in the face of terror. He defends the logic of preemption, which led to the invasion of Iraq, but curiously does not link Libyan leader Mu'ammar al-Qadhafi's decision to surrender his nuclear program to the demonstration of U.S. power. While Bush defends his administration's support of dissidents, he ignores the backsliding that occurred in his second term in Egypt and Lebanon, which arguably left democrats and liberals in a worse position than before. And, when discussing the Annapolis peace process, he never reconciles this with his first-term refusal to deal with terrorist leaders. Nor does he address his administration's reversal on Iran, offering incentives and diplomatic concessions despite continuing Iranian defiance of U.N. Security Council resolutions. The Middle East constituted the chief U.S. foreign policy challenge of the Bush years, and there is little doubt that 9/11 represented a paradigm shift in U.S. policy. But whether historians will accept Bush's claims to success, outlined at the Saban Center, remain to be seen. 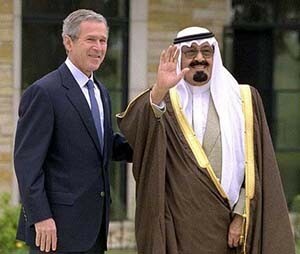 President George W. Bush stands with Crown Prince Abdullah of Saudi Arabia, April 25, 2002, at the Bush Ranch in Crawford, Texas. The president noted during his speech to the Saban Forum that although Saudi Arabia has been "a breeding ground for radicalism," the kingdom has now "become a determined partner in the fight against terror." From our earliest days as a nation, the Middle East has played a central role in American foreign policy. One of America's first military engagements as an independent nation was with the Barbary pirates. One of our first consulates was in Tangiers. Some of the most fateful choices made by American Presidents have involved the Middle East—including President Truman's decision to recognize Israel 60 years ago this past May. In the decades that followed that brave choice, American policy in the Middle East was shaped by the realities of the Cold War. Together with strong allies in the Middle East, we faced down and defeated the threat of communism to the region. With the collapse of the Soviet Union, the primary threat to America and the region became violent religious extremism. Through painful experience, it became clear that the old approach of promoting stability is unsuited to this new danger—and that the pursuit of security at the expense of liberty would leave us with neither one. Across the Middle East, many who sought a voice in the future of their countries found the only places open to dissent were radical mosques. Many turned to terror as a source of empowerment. And as a new century dawned, the violent currents swirling beneath the Middle East began to surface. In the Holy Land, the dashed expectations resulting from the collapse of the Camp David peace talks had given way to the second intifada. Palestinian suicide bombers struck with horrific frequency and lethality. They murdered innocent Israelis at a pizza parlor, or aboard buses, or in the middle of a Passover Seder. Israeli Defense Forces responded with large-scale operations. And in 2001, more than 500 Israelis and Palestinians were killed. Politically, the Palestinian Authority was led by a terrorist who stole from his people and walked away from peace. In Israel, Ariel Sharon was elected to fight terror and pursue a "Greater Israel" policy that allowed for no territorial concessions. Neither side could envision a return to negotiations or the realistic possibility of a two-state solution. Elsewhere in the Middle East, Saddam Hussein had begun his third decade as the dictator of Iraq—a reign that included invading two neighbors, developing and using weapons of mass destruction, attempting to exterminate Marsh Arabs and many Kurds, paying the families of suicide bombers, systematically violating U.N. resolutions, and firing routinely at British and U.S. aircraft patrolling a no-fly zone. Syria continued its occupation of Lebanon, with some 30,000 troops on Lebanese soil. Libya sponsored terror and pursued weapons of mass destruction. And in Iran, the prospect of reform was fading, the regime's sponsorship of terror continued, and its pursuit of nuclear weapons was largely unchecked. Throughout the region, suffering and stagnation were rampant. The Arab Human Development Report revealed a bleak picture of high unemployment, poor education, high mortality rates for mothers, and almost no investment in technology. Above all, the Middle East suffered a deep deficit in freedom. Most people had no choice and no voice in choosing their leaders. Women enjoyed few rights. And there was little conversation about democratic change. Against this backdrop, the terrorist movement was growing in strength and in ambition. For three decades, violent radicals had landed painful blows against America—the Iranian hostage crisis, the attacks on our embassy and Marine barracks in Beirut, the destruction of Pan Am Flight 103, the truck bombing of the World Trade Center, the attack on Khobar Towers, the bombing of our embassies in Kenya and Tanzania, and the strike on the USS Cole. And then came September the 11th, 2001, when 19 men from the Middle East carried out the worst attack on the United States since the strike on Pearl Harbor 67 years ago this weekend. In the space of a single morning, 9/11 etched a sharp dividing line in our history. We realized that we're in a struggle with fanatics pledged to our destruction. We saw that conditions of repression and despair on the other side of the world could bring suffering and death to our own streets. With these new realities in mind, America reshaped our approach to the Middle East. We made clear that we will defend our friends, our interests, and our people against any hostile attempt to dominate the Middle East—whether by terror, blackmail, or the pursuit of weapons of mass destruction. We have carried out this new strategy by following three overriding principles. First, we took the offense against the terrorists overseas. We are waging a relentless campaign to break up extremist networks and deny them safe havens. As part of that offensive, we pledged to strengthen our partnership with every nation that joins in the fight against terror. We deepened our security cooperation with allies like Jordan and Egypt, and with our friends in the Gulf. Saudi Arabia, long a breeding ground for radicalism, has become a determined partner in the fight against terror—killing or capturing hundreds of al Qaeda operatives in the Kingdom. We dramatically expanded counterterrorism ties with partners in North Africa. And we left no doubt that America would stand by our closest ally in the Middle East—the state of Israel. Second, we made clear that hostile regimes must end their support for terror and their pursuit of weapons of mass destruction, or face the concerted opposition of the world. This was the approach we took in Iraq. It is true, as I've said many times, that Saddam Hussein was not connected to the 9/11 attacks. But the decision to remove Saddam from power cannot be viewed in isolation from 9/11. In a world where terrorists armed with box cutters had just killed nearly 3,000 of our people, America had to decide whether we could tolerate a sworn enemy that acted belligerently, that supported terror, and that intelligence agencies around the world believed had weapons of mass destruction. It was clear to me; it was clear to members of both political parties, and to many leaders around the world that after 9/11, that was a risk we could not afford to take. So we went back to the United Nations Security Council, which unanimously passed Resolution 1441 calling on Saddam Hussein to disclose, disarm, or face serious consequences. With this resolution, we offered Saddam Hussein a final chance to comply with the demands of the world. And when he refused to resolve the issue peacefully, we acted with a coalition of nations to protect our people and liberated 25 million Iraqis. … When Saddam's regime fell, we refused to take the easy option and install a friendly strongman in his place. Even though it required enormous sacrifice, we stood by the Iraqi people as they elected their own leaders and built a young democracy. When the violence reached its most dire point, pressure to withdraw reached its height. Yet failure in Iraq would have unleashed chaos, widened the violence, and allowed the terrorists to gain a new safe haven—a fundamental contradiction to our vision for the Middle East. So we adopted a new strategy and deployed more troops to secure the Iraqi people. When the surge met its objective, we began to bring our troops home under the policy of return on success. Yesterday, building on the gains made by the surge, the democratic government of Iraq approved two agreements with the United States that formalize our diplomatic, economic, and security ties and set a framework for the drawdown of American forces as the fight in Iraq nears its successful end. After 9/11, we also confronted Libya over its weapons of mass destruction. The leader of Libya made a wise choice. In 2003, Colonel Qadhafi announced that he would abandon his weapons of mass destruction program. He concluded that the interests of his people would be best served by improving relations with America, and Libya turned over its nuclear centrifuges and other deadly equipment to the United States. The defeat of Saddam also appears to have changed the calculation of Iran. According to our intelligence community, the regime in Tehran had started a nuclear weapons program in the late-1980s, and they halted a key part of that program in 2003. America recognized that the most effective way to … persuade Iran to … renounce its nuclear weapons ambitions was to have partners at our side, so we supported an international effort led by our allies in Europe. This diplomacy yielded an encouraging result when Iran agreed to suspend its uranium enrichment. Sadly, after the election of President Ahmadinejad, Iran reversed course and announced it would begin enriching again. Since then, we've imposed tough sanctions through United Nations resolutions. We and our partners have offered Iran diplomatic and economic incentives to suspend enrichment. We have promised to support a peaceful, civilian nuclear program. While Iran has not accepted these offers, we have made our bottom line clear: For the safety of our people and the peace of the world, America will not allow Iran to develop a nuclear weapon. Third, America identified the lack of freedom in the Middle East as a principal cause of the threats coming from the region. We concluded that if the region continued on the path it was headed—if another generation grew up with no hope for the future, and no outlet to express its views—the Middle East would continue to simmer in resentment and export violence. To stop this from happening, we resolved to help the region steer itself toward a better course of freedom and dignity and hope. We're engaged in a battle with the extremists that is broader than a military conflict, and broader than a law enforcement operation. We are engaged in an ideological struggle. And to advance our security interests and moral interests, America is working to advance freedom and democracy as the great alternatives to repression and terror. We're encouraging Middle Eastern women to get involved in politics, and to start their own businesses, and take charge of their health through wise practices like breast cancer screening. Efforts like these extend hope to the corners of despair, and in this work we have had a lot of help, but no finer ambassador of goodwill than my wife, Laura Bush. …America has launched a sustained initiative to help bring peace to the Holy Land. At the heart of this effort is the vision of two democratic states, Israel and Palestine, living side by side in peace and security. I was the first American President to call for a Palestinian state … and build[ing] support for the two-state solution has been a top priority of my administration. To earn the trust of Israeli leaders, we made it clear that no Palestinian state would be born of terror; we backed Prime Minister Sharon's courageous withdrawal from Gaza, and we supported his decision to build a security fence, not as a political border but to protect the people from terror. To help the Palestinian people achieve the state they deserve, we insisted on Palestinian leadership that rejects terror and recognizes Israel's right to exist. Now that this leadership has emerged, we're strongly supporting its efforts to build institutions of a vibrant, democratic state. With good advice from leaders like former Prime Minister Tony Blair and Generals Jones, Dayton, Fraser, and Selva, the Palestinians are making progress toward capable security forces, a functioning legal system, government ministries that deliver services without corruption, and a market economy. In all our efforts to promote a two-state solution, we have included Arab leaders from across the region because we fully understand that their support will be essential for the creation of a state and lasting peace. Last fall at Annapolis, Israeli, Palestinian, and Arab leaders came together at an historic summit. President Abbas and Prime Minister Olmert agreed to launch direct negotiations on a peace agreement. Nations around the globe, including many in the Arab world, pledged to support them. The negotiations since Annapolis have been determined and substantial…. …The Middle East in 2008 is a freer, more hopeful, and more promising place than it was in 2001: For the first time in nearly three decades, the people of Lebanon are free from Syria's military occupation. Libya's nuclear weapons equipment is locked away in Oak Ridge, Tennessee. Places like the United Arab Emirates and Bahrain are emerging as centers of commerce… The regime in Iran is facing greater pressure from the international community than ever before. Terrorist organizations like al Qaeda have failed decisively in their attempts to take over nations. They're increasingly facing ideological rejection in the Arab world. Iraq has gone from an enemy of America to a friend of America, from sponsoring terror to fighting terror, and from a brutal dictatorship to a multi-religious, multi-ethnic constitutional democracy. Instead of the Iraq we would see if a Saddam Hussein were in power—an aggressive regime vastly enriched by oil, defying the United Nations, bullying its Arab neighbors, threatening Israel, and pursuing a nuclear arms race with Iran—we see an Iraq emerging peacefully with its neighbors, welcoming Arab ambassadors back to Baghdad, and showing the Middle East a powerful example of a moderate, prosperous, free nation. On the most vexing problem in the region—the Israeli-Palestinian conflict—there is now greater international consensus than at any point in modern memory. Israelis, Palestinians, and Arabs recognize the creation of a peaceful, democratic Palestinian state is in their interests. And through the Annapolis process, they started down a path that will end with two states living side by side in peace. In fits and starts, political and economic reforms are advancing across the Middle East. Women have run for office in several nations and been named to important government positions in Bahrain and Oman and Qatar, the United Arab Emirates, and Yemen. Trade and foreign investment have expanded. Several nations have opened up private universities, and Internet use has risen sharply. Across the region, conversations about freedom and reform are growing louder. Expectations about government responsiveness are rising. And people are defying the condescending view that the culture of the Middle East is unfit for freedom. There are still serious challenges facing the Middle East. Iran and Syria continue to sponsor terror. Iran's uranium enrichment remains a major threat to peace. Many in the region still live under oppression. Yet the changes of the past eight years herald the beginning of something historic and new. At long last, the Middle East is closing a chapter of darkness and fear, and opening a new one written in the language of possibility and hope. For the first time in generations, the region represents something more than a set of problems to be solved, or the site of energy resources to be developed. A free and peaceful Middle East will represent a source of promise, and home of opportunity, and a vital contributor to the prosperity of the world. Those who ask what this future will look like need only look around. We see the new story of the Middle East in Iraqis waving ink-stained fingers, with Lebanese taking to streets in the Cedar Revolution. We see it in women taking their seats in elected parliaments, and bloggers telling the world their dreams. We see it in the skyscrapers rising above Abu Dhabi, and … thriving Middle Eastern businesses that are now connected to the global economy. We see it in a Saudi king sponsoring an interfaith dialogue, Palestinian reformers fighting corruption and terror, and Israelis who love their ancient land but want to live in peace. These are striking images, and they do point the way to a brighter future. I believe the day will come when the map of the Middle East shows a peaceful, secure Israel beside a peaceful and democratic Palestine. I believe the day will come when people from Cairo and Riyadh to Baghdad and Beirut, to Damascus and Tehran, live in free and independent societies, bound together by the ties of diplomacy and tourism and trade. The day will come when al Qaeda and Hezbollah and Hamas are marginalized and then wither away, as Muslims across the region realize the emptiness of the terrorists' vision and the injustice of their cause. "President Bush Attends Saban Forum 2008," The White House, Dec. 5, 2008. "President Bush Calls for New Palestinian Leadership," The White House, June 24, 2002. Related Topics: US policy | Spring 2009 MEQ receive the latest by email: subscribe to the free mef mailing list This text may be reposted or forwarded so long as it is presented as an integral whole with complete and accurate information provided about its author, date, place of publication, and original URL.